Leather Half Chaps in black. These full leather adult half chaps are extremely comfortable and durable. They are made from best quality top grain leather. The chaps feature a elasticated crimped section at the back that is also covered in leather and allows the chap to contour the leg for the perfect fit. 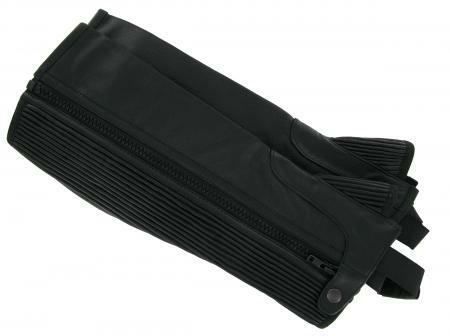 Heavy duty YKK zips and leather covered foot strap make a chap that will last. These chaps are Black leather please see CLC2 for Brown.